There are different ways adopted to cool a drink. Some people love chilled drinks, placed in a refrigerator before consumption; whereas, while others like to use ice cubes to enjoy a refreshing drink in hot weather. If you are a little creative, you can spice up your drink by using fruit ice cubes, which can also be a fun way. The first step towards making fruit ice cubes is to boil a pot of water and allow it to cool before you pour them in the ice cube tray. You must remember that ice made of boiled water turns out clearer as compared to normal water. The next step is to select the variety of fruits that you wish to use in your ice cubes. Raspberries, strawberries, oranges and lemon freeze quite well. Cherries and blueberries are small enough to use as a whole. Before you cut the fruits into pieces that fit in different sections of the ice cube tray, you are required to remove skin, rind and seeds from fruit. You can now place a piece of fruit carefully into the water in each section of the ice cube tray. You should leave the sections full by allowing excess water to spill out. You can now place the ice cubes in the freezer. Let them freeze for a few hours so that they are properly frozen. 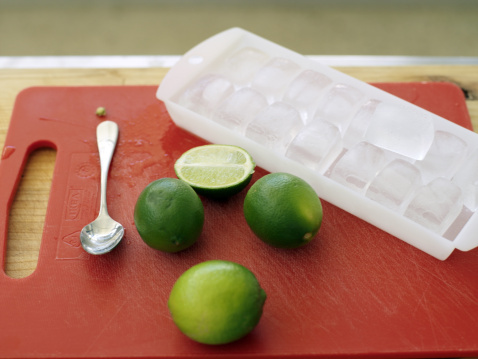 Once the ice cubes have been properly frozen, you can remove them from the ice cube tray and serve them in the drinks. The fruit ice cubes are going to enhance the overall presentation of your drink.